“Bread, fresh bread!” Celia shouted over the hum of the crowd. Surrounded by loaves of home-made bread, her stall was just one of dozens that packed into the main plaza of the Mexican village of Cholula on Saturday. The loaves were selling well, but Celia’s money box was empty. “I’ll give you bread if you, for example, give me your clothes,” she joked. “This is the trueque; it’s all about exchange,” she added. Trueque, or barter, is a pre-Hispanic tradition that’s being kept alive in Cholula. Long before Hernan Cortes and his posse of conquistadores came rampaging through Mexico, Cholula was a crossroads of Indigenous Mexican cultures. As far back as 200 BC, the settlement was one of central Mexico’s most important trade hubs. Here, agricultural produce would be exchanged for luxury goods from the Pacific coast. Later, Cholula became a major producer of textiles, which were bought up by travelling merchants and whisked away to the far corners of the Mesoamerican world. Trade was booming, but there was just one problem: nobody had any money. Products like cacao beans were often used in pre-Hispanic Mexico like a currency, but they weren’t always particularly practical. While the wealthy merchants that passed through may have had sacks of cacao to trade, for ordinary Cholutecans bartering was a way of life. 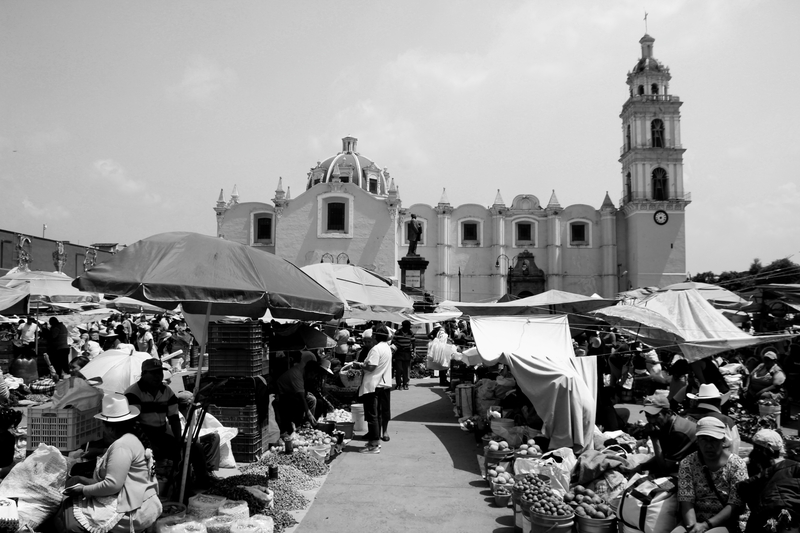 Nowadays, Cholula’s annual trueque still brings farmers and artisans from across the region to exchange goods by barter. “They come here to exchange things like hand-made toys for food,” explained Daniel. With a choice spot right near the middle of the plaza, Daniel was selling a colourful assortment of mueganos – a kind of sweet popular in central Mexico. “These mueganos are all hand-made,” he boasted proudly. I didn’t have anything to trade, though Daniel was happy to take a few pesos for a bag of his sweets. “The trueque is an important custom, though,” he said, explaining how the custom has become part of Cholula’s heritage. The trueque is the centrepiece of Cholula’s annual cultural festival, which takes place during the first two weeks of October. Along with trueque, the festival also features other cultural events, not to mention an avalanche of street food. While you’re there, don’t miss out trying the local variety of cecina. A kind of dried beef popular throughout Mexico, Cholutecans fervently believe their cecina is the best, and I’m inclined to agree.